¡Hola! 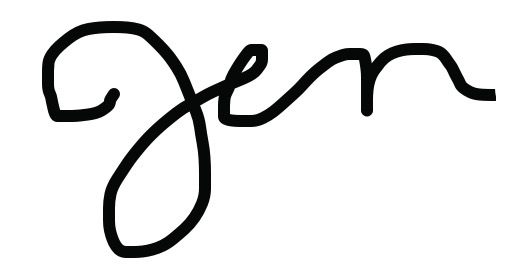 I'm Jen from Spanish with Sra. Shaw and I'm so excited to be joining with the other teachers on this collaborative blog to share a diverse array of ideas for secondary Spanish classes. Today I'm going to share with you 7 reasons why I love Quizlet Live, a collaborative vocabulary learning game. At this point, it's probable that you've at least heard of, if not already used, some of the technology-based multiplayer learning games in the realm of Kahoot!, Quizziz, and Quizalize. Of those, I prefer Quizziz because it's organized and effective, while Kahoot, no matter my good intentions and management, tends to result in more chaos than I like. When Quizlet Live stepped onto the scene, I initially assumed that it was just a different take on flashcards. I soon realized, however, that it was the perfect blend of organization, motivation, fun, and most importantly, efficiency. Plus it's unique because it groups students into teams. 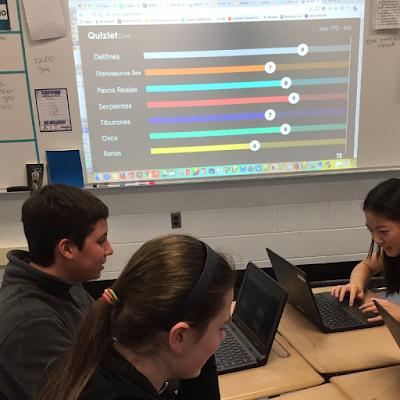 Quizlet Live's purpose is for students to learn and reinforce their knowledge of vocabulary. You can play with any of your Quizlet sets or the sets of other users. (see my video below to see it in action). Each student needs a device. Any device that connects to the internet will do. I suppose students could play in pairs, but then you'd have groups of 6-8 kids and that seems like a lot to me. Students prefer to use tablets or phones because it is easier to click, so I try to reserve the iPads when I play, but I'll play with any device I can get my hands on. It also helps if the teacher has a projector so kids can see the join code and which team is winning, but that isn't an utter necessity. Before I played, I had a hard time imaging what it would look like in the classroom, so for all of the visual learners like myself out there, I thought it would help if I made a video of my students logging on and playing to give you a the general idea of how easy it is to setup and play. My kids absolutely love playing this game! It's so much fun, it's competitive, and they get to play on teams. They literally beg to play and it's amazing how superior their behavior is compared to Kahoot, which always turns my usually well-organized classroom into a zoo. My kids seem to like Quizlet Live more than Kahoot! and I definitely do, so it's a win-win. There's no doubt that students learn vocabulary while they play Quizlet Live. While I work toward proficiency and the majority of time in my class is focused on the 3 modes (interpretive, interpersonal, presentational) of communication, I also teach in a large district where I am required to provide my students mandated vocabulary sets. Plus, let's be honest, kids can't speak Spanish without an array of words and Quizlet Live gets my students to learn vocabulary in a way they find meaningful and motivating I think that's awesome. I think whoever thought up Quizlet Live is genius! The teamed, collaborative aspect makes it unique from all of the other similar vocabulary learning games out there. Just like you'd expect if you've played Kahoot! or Quizziz in your classroom, students have a join code. Once all of your students join, Quizlet Live automatically breaks them into small groups with team names of Spanish animals. What's more is that students pretty much have to communicate to succeed. You'll hear them ask one another things like, "Hey, who's got 'almuerzo'?" because the team's success depends on each member of the group. If someone gets one wrong, the whole group starts back at zero, so Quizlet Live is a true lesson in teamwork. Usually after one team wins three times, I click "shuffle groups", which is really easy and doesn't require students to rejoin. Some vocabulary games can take way too much time to create, but you can play Quizlet Live with any of your previous vocabulary sets or those of other users. If desired, you can even combine multiple sets into one big set with a few clicks. I'm perfectly happy to spend hours creating perfect assessments and to pour time into building other activities for my classes, but Quizlet Live takes absolutely no time to set up. What educator doesn't love that? It's perfect for one of "those days" when you're trying to balance classes, before a break when you don't want to resort to a movie, or as a reward day for your students. When people think of Quizlet flashcards and their use in the world language classroom, most picture Spanish words paired with English translations. Sure, I provide Spanish/English sets for students on my website, but I'm trying to get my students to think in the target language. As such, I prefer Quizlet sets that pair Spanish words with images and even with clue descriptors in the target language. For example, let's take the Spanish word "alto." You could just pair it with "tall," but wouldn't it be so much more proficiency-based to use a picture of a tall person or a Spanish phrase like "No es una persona baja?" Both the image and the clue encourage students to think in the target language and the later option theoretically would make the activity geared toward the interpretive mode. Like most teachers probably do, I started using Quizlet Live as a review activity once they had already learned a vocabulary set. I found it worked perfectly before an assessment or just to practice vocab. What I wasn't expecting, however, was a great deal of success on a day that I decided to experiment and use Quizlet Live to pre-teach my students key vocabulary featured in an authentic resource I was using to introduce a new unit's theme. In another instance, I paired some Spanish animal vocab with images for my 7th grade students before starting our habitat unit and I've never seen my students learn the vocabulary so quickly or be so engaged in the vocabulary learning. If we're really honest, vocabulary learning can be involve a lower-order thinking skills and a lot of rote memorization. What I've found with Quizlet Live, however, is that this activity really motivates my students to learn the vocabulary and to take ownership over their learning for all of the reasons I discussed above. My kids are having fun learning with their friends and no kid wants to be the one to let their team down, so I've found even my most disengaged students really push themselves with Quizlet Live, but it's lower pressure than games like Kahoot! or Quizziz because there isn't an individual ranking system. Students can only see their team's ranking and I love that group versus individual mentality. I hope this post provided some new ideas of how to use Quizlet Live with your students. In what fun ways do you use vocabulary learning games in your classroom? I'd love to hear about your experiences using Quizlet Live and the creative twists you've got in your arsenal! Please leave your fun ideas and suggestions in the comments below! Hoping you are all enjoying a relaxing and/or fun-filled winter break! I have seen colleagues use Quizlet live and as the resident 90%+ target language guy on the team I have been hesitant because I hear lots of English being used by the teacher and the students when setting up an playing, particularly when showing understanding by translating. It has also always looked like a translation, rather than language creation, type of activity. I have a huge amount of respect for you and your proficiency-based approach to teaching foreign language, so I am thinking that I need to take another look since you endorse it. I'd be interested to know how you use Quizlet live to promote proficiency. It looks like you use it as a comprehensible input tool when introducing new vocabulary. Am I understanding that correctly? Thanks for the post. Ohhhh my goodness I played Quizlet Live this past week with third and fifth graders! The third graders are generally a quiet and obedient bunch, and their vocabulary set is more familiar to them. They were happy and engaged with each other. You know those Kahoot memes floating around the internet? Quizlet Live is five times more intense. One class insisted on keeping their same team and playing over and over and over again; other classes mixed up their teams. We had to make a rule that we can't play Quizlet Live unless one student is absent as she dominated every team she played on. To piggy back on Joshua's comment, I agree that I heard SO much English :( :( during our Quizlet Live time. As a vocabulary acquisition activity, my students gave it high marks: "On a scale of 1-5, 1 being you feel like this is Chinese and you're super confused, 5 being you could go home and teach someone these words, how do you feel?" An overwhelming majority of my students felt very confident with the vocabulary. However, does that mean they can use it to tell me where they're going and to do what activity? "Voy al centro comercial. Quiero comprar." I'm not convinced. TL;DR: Quizlet Live is fun. Quizlet Live is not necessary communicative.